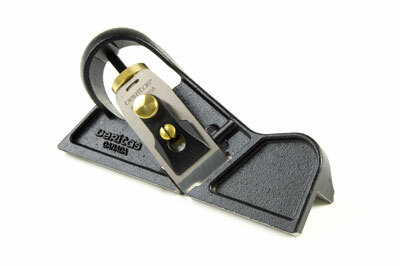 When I first arrived in Lewes I had a rummage around in the F&C toolbox and to my surprise, I came across a plane that I had never used before: the Veritas iron edge-trimming plane. 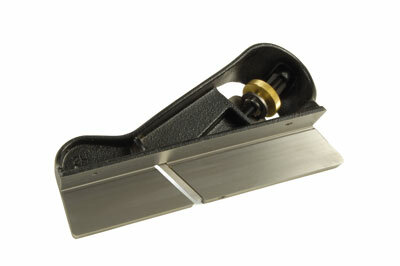 As the name implies, the plane is used for squaring the edges of boards and can be used on long grain or end grain. As every cabinet maker knows, when you want to joint boards together using a rub joint, the procedure is to plane the edges of adjacent boards at the same time, thereby ensuring supplementary angles on the adjacent faces. The boards are then opened out like a book prior to glue-up. This clever little Veritas plane ensures a square 90 degree edge on both of the edges to be jointed together, and on the end grain faces of boards. The power tool user may well argue that a router could do the same job. However, this little tool will do something that a router would find extremely difficult to do without using a lot of jigs: if a tapered wedge is fitted, this plane will cut bevels for coopered work. Of course, a tilting arbor saw can also do that job, but I prefer hand tools. There are both left- and right-handed versions, though this is not necessarily for the benefit of the user, but for the possibility of dealing with difficult grain and single sided reference surfaces such as mouldings. In use I found that I used both hands and the tool could be operated in both push and pull modes, with a usable width of cut of 25mm (1in). A pair of left- and right-handed planes would cover all grain possibilities, but is by no means essential. One nice touch found on a lot of Veritas planes is the small set screws on either side of the blade. These allow precise register for the lateral adjustment of the blade. As the blade on this plane is set at a skew to give a better approach angle, these screws enable a very precise and positive blade setting which won't be disturbed in use. However, without careful observation, there is the potential for skewing the blade at a compound angle, which would result in an unwanted bevel. Like all tools, you should really carry out a trial set-up first on a piece of scrap and use an engineer's square to check your settings. The version of the plane I tested was set up with A2 steel blades, though 01 blades are also available. It is a remarkable little tool, and although it is not one that you will use every day, each time you do you will be glad you bought it. A little note for Veritas Bevel-Up Jointer Plane owners: Veritas produce a right angle fence for the jointer which will do a similar job to the edge-trimming plane shown here! "It is a remarkable little tool"